I’ve gotten into eating Kind bars lately, so whenever I go to Costco, I always check their snack aisle to see if they’ve gotten in any new flavors. 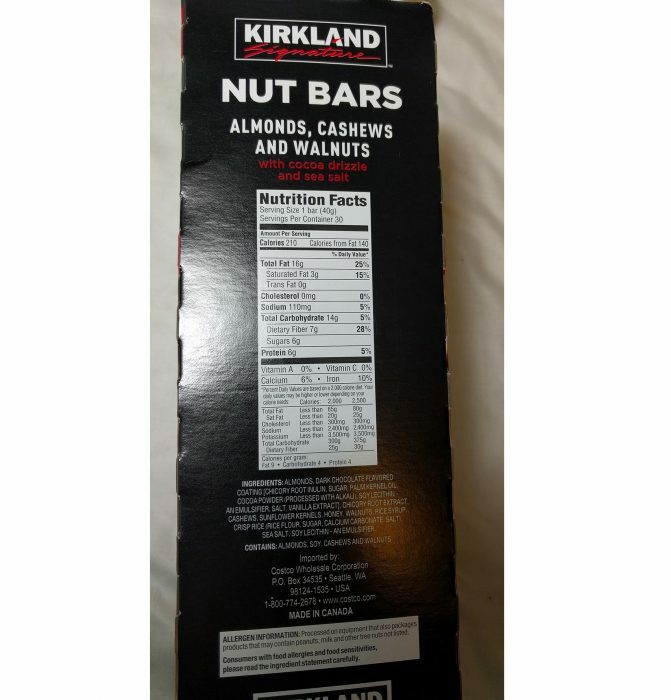 What caught my eye instead were these Kirkland Signature Nut bars. At first glance, I was sure that they were going to be high in sugar, but upon examining the nutrition label, I noticed that their nutrition profile was surprisingly similar to Kind branded nut bars. 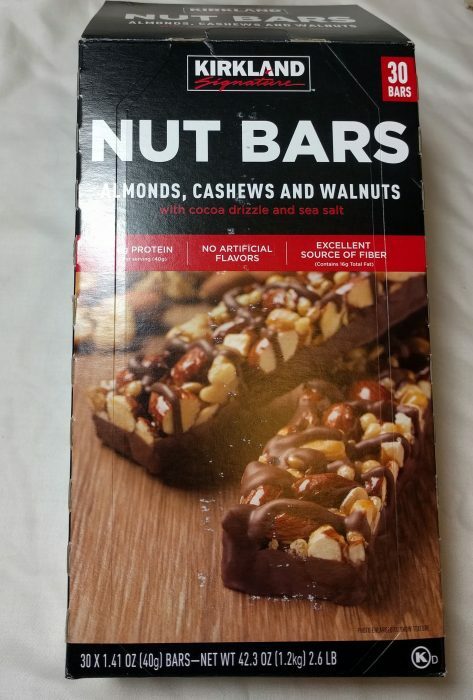 These contain almonds, cashews, walnuts, sunflower seeds, and dark chocolate. Take a close-up look at this nutty snack! Allergen Information: Processed on equipment that also packages products that may contain peanuts, milk, and other tree nuts not listed. Like most Kind bars, the Kirkland Signature Nut bars are just over 200 calories each, and they have only 6 grams of sugar. And they are high in fiber, containing 7 grams of fiber per bar! The total carbohydrate count is 14 grams. If you count carbs, you know to always subtract the fiber count from the total carb count to get the net carbs. In this case, each bar is only 7 grams net carbs. That’s quite low. So what makes these bars different from the more expensive Kind bars? Do they taste icky? Not at all. I think they’re absolutely delicious. They’re not nearly identical to any of the Kind bars in taste — yes, they contain nuts and chocolate, but these Kirkland bars also contain sunflower seeds. If you like sunflower seeds, you might just love these. So, these nut and sunflower seed bars are a really easy, mess-free, guilt-free snack. And easy on the pocketbook too, at only 73 cents a bar. So, similar nutrition profile, but different ingredients. And a different great taste. Am I going to stop eating Kind bars? No way. But am I going to also buy these again? You betcha! Thank you so much for taking the time to write this article. It really helped me make a decision today. I am kind of addicted to Kind but this box at Costco looked really good. I was curious about sugar content and you’ve answered my question. I love these bars!!! So delicious, and hit the spot for a craving, and protein hungry feeling. I love um. I bought a case of these and yes! they are delicious, and more economical than Kind Bars. However, I just received a diagnosis of Celiac Disease and I can’t tell if these are gluten-free. I know that none of the listed ingredients contain gluten, but perhaps these are processed in equipment that processes wheat and therefore cross-contaminated? I’ve searched the Internet and can’t find my answer. I hate to throw these out…. I could bequeath them to a friend though. Can anyone tell me the answer? There are no ingredients that contain gluten. Call the Canadian manufacturer and verify. Please somebody can tell me if the bars are gluten free?